Trade shows are key to marketing and promotion for both the manufacturer and the distributor. 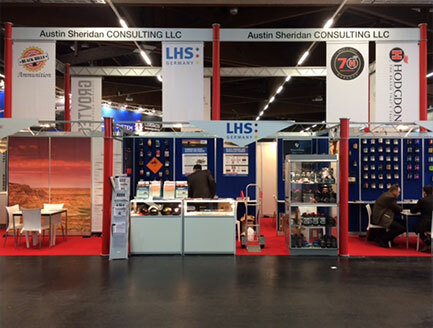 Austin Sheridan has been an exhibitor at SHOT (Shooting Hunting Outdoor Trade) Show in the USA from 1989-2018. He will continue to host international clients attending SHOT Show and facilitate meetings with major US producers. The NASGW (National Association of Sporting Goods Wholesalers) is another US exhibition, which provides the opportunity for distributors and manufacturers to meet in a smaller venue when new pre-annual programs are being presented months ahead of SHOT and IWA. 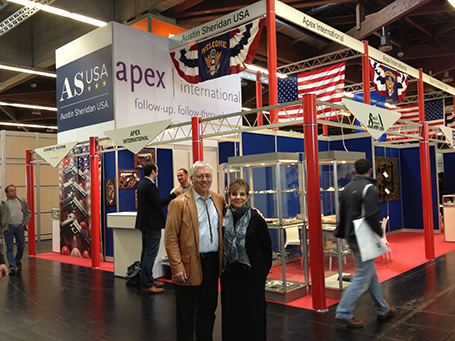 Austin has been attending the IWA Exhibition in Germany for 28 years and sponsors a 2000 square foot exhibit there, presenting a platform for American manufacturers. As coordinator for all the partners participating in the IWA booth, Austin Sheridan simplifies the process of exhibiting internationally by providing a full service booth that includes registration with catalog listings, translators, wireless internet connections, meeting rooms and individual, furnished display areas for each company with logo/signs. Display and sample shipments by sea and air are consolidated for cost efficiency with international and local transportation.